(Click on ADD YOUR INFO below) If you want to change your info or photo, you will have to click on EDIT YOUR PROFILE. You will also need to remember your password from when you first entered your information. If you cannot remember your password, you will need to create a new profile - we do not have access to your password to help you. Once you create a new profile, we will be notified and I will transfer your photo to your new profile and delete your old profile. Don't worry if you forget something or want to change it - you can always come back and edit it later (just remember your sign-in info). We can add your "Then" picture. Note: A few people mentioned they had trouble adding Comments (bio)... If you are unable to type in the comment box, you can send your bio to me (Bob Richardson - bob@rwrmarketing.com) and I will add it for you - along with your Then picture. 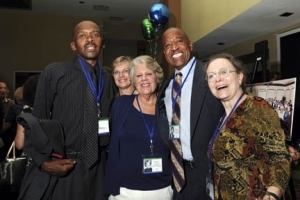 Gene Lefedge, Lois Stouffer, Karen Kesecker Shellenberger, Melvin Crawford, Susan Baker. 1972-1984 Grand Forks North Dakota. GI bill. Hospital Ambulance Paramedic, parttime sudies leading to BSBA. Nursing home dietary manager 3 years. Construction inspector supervisor building highways and bridges. From Rick: FORTY YEARS, now this'll test the old brain cells! WCHS to VaTech (1 yr, I didn't care much for the male to co-ed ratio of 11-1). Off to U of MD, where I graduate.Then play and work and play at the Raleigh Inn in Bethesda. Become a manager and move to Dallas, Tx. to manage Bennigan's Restaurants. Homesick and tired of Cowboy fans, we move to No. Va. to sell new homes for Fairfield Homes. Become a Division Manager/ VP. Another career change, this time to mortgage banker for Norwest Mortgage, which becomes Wells Fargo Home Mortgage. Become the builder branch manager and build (pun intended) Wells' most profitable builder branch! After 14 glorious years and just prior to the sub prime mess, I retire in Oct. '05. And no I don't have any problem sleeping at night as Wells had virtually no expose to sub prime loans. Unfortunately, Wells was guilty by association. Life hasn't been all work and no play. I met the one and only Mrs. B.,Vanessa, at the Raleigh Inn. We have four great kids, Erin, Alison, Kelsey and Peyton. The oldest two are out of college and working nice jobs locally. Erin just got married to a wonderful guy in April. Our other two are in college, Peyton starts this August. With our soon to be empty nest we'll be able to spend more time at our second home on Deep Creek Lake in Western Md., where we also own some acreage. It is here that we enjoy a host of outdoor activities from golf to boating, four wheeling to snowmobiling and fishing to hunting. From Bill: Just To Update my profile finely. Still here, but older and slower.